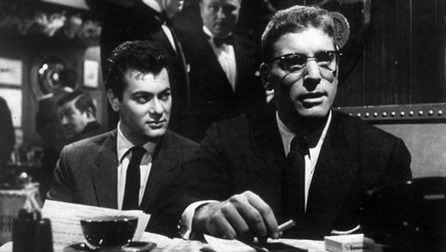 Sweet Smell of Success – Did You See That One? J.J. Hunsecker (Lancaster) is an volatile Broadway columnist who has enlisted the help of unethical press agent Sidney Falco (Curtis). Hunsecker wants Falco to break up the budding romance between his sister (Harrison) and a young jazz musician (Milner). This 1957 film is a unique version of film noir based on the novella by Ernest Lehman. Lehman (North by Northwest) and Clifford Odets (Humoresque) co-wrote the screenplay. The movie was directed by Alexander Mackendrick (The Man in the White Suit). The movie stars Burt Lancaster (Field of Dreams), Tony Curtis (Some Like It Hot), Susan Harrison (Key Witness), and Martin Milner (Valley of the Dolls). This is a wonderfully written story that plays with the themes and styling of film noir in very unique ways. The characters are a mix of flawed and selfish individuals who each have their own agendas in the story. The ruthless nature of the Hunsecker character was partially based on Walter Winchell. Ernest Lehman also based much of the story on his work as assistant to press agent Irving Hoffman. The writing does a wonderful job of putting Sidney Falco in an awkward position from the very beginning. The mix of desperation and frustration written into the role really help to create immediate tension in the film. The character of Sidney Falco is also written to contrast nicely with J.J. Hunsecker. All of this built-in tension goes a long way in making this an entertaining film that pays off on all the right setups. The writing also brings out the strength of the women written into the story. Unlike many film noir movies, this one seems to avoid creating a clear femme fatale. Finally, the dialogue in this movie can’t be ignored. The somewhat cold and rapid fire dialogue plays nicely with the plot. Overall, this is a very good story that plays out thanks to the nice twists and turns throughout. The acting in this movie elevates this from a good movie to a great one. 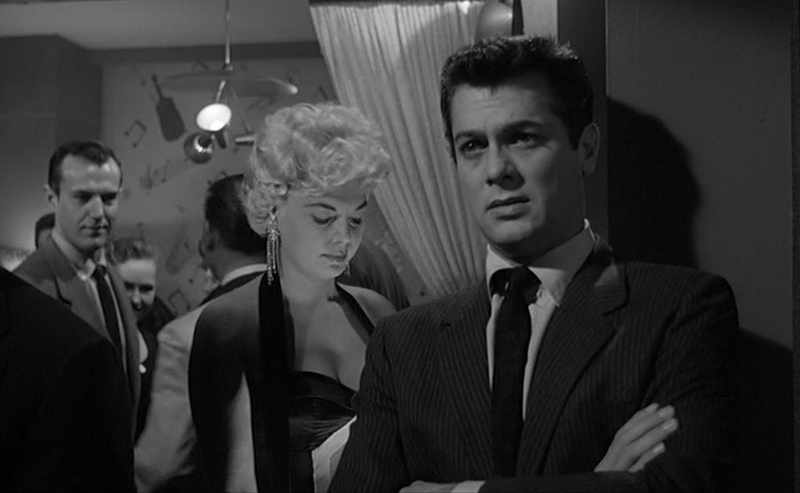 Tony Curtis brings out the frustration, anxiety, and anger of his character wonderfully. His performance also finds all the right moments to bring out some added intensity. He also seemed to understand the unethical nature of his incredibly flawed character. This understanding allowed him to bring out the right sense of selfishness in the role. 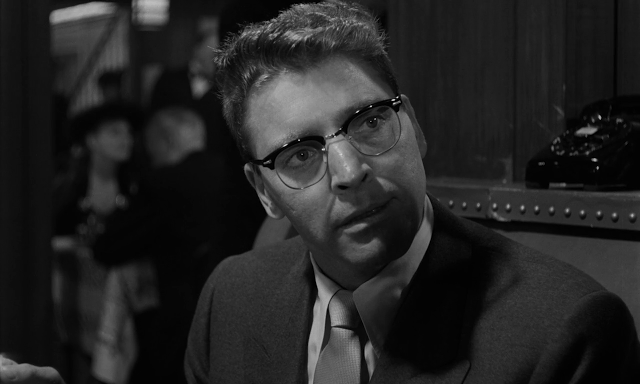 He’s paired opposite Burt Lancaster, who also gives a great performance. Lancaster does excellent work bringing out the ruthless nature of the character while maintaining the outward appearance of control. The two men have great chemistry together in this film as well. 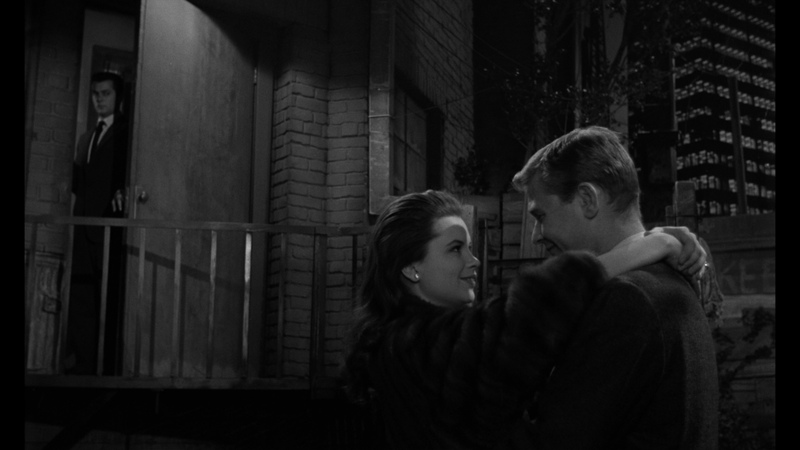 Susan Harrison and Martin Milner also do nice work in this one. Along with the rest of the cast, these actors really bring this one to life wonderfully. The film utilizes the visual styling of film noir against the backdrop of New York City. The light and shadow contrasts are used to bring out much of the tension in the film. The set decoration and costuming also add a lot to the feel of this one. The cinematography really works to capture the essence of the story. James Wong Howe (Yankee Doodle Dandy) did a wonderful job creating positions of power and vulnerability through his images. In addition, this film has an excellent score by Elmer Bernstein (The Age of Innocence). Overall, the production value of this film can’t be ignored. The sound and visual work add a lot to the overall feel of this one. Surprisingly, this film did not appeal to audiences when it was initially released. 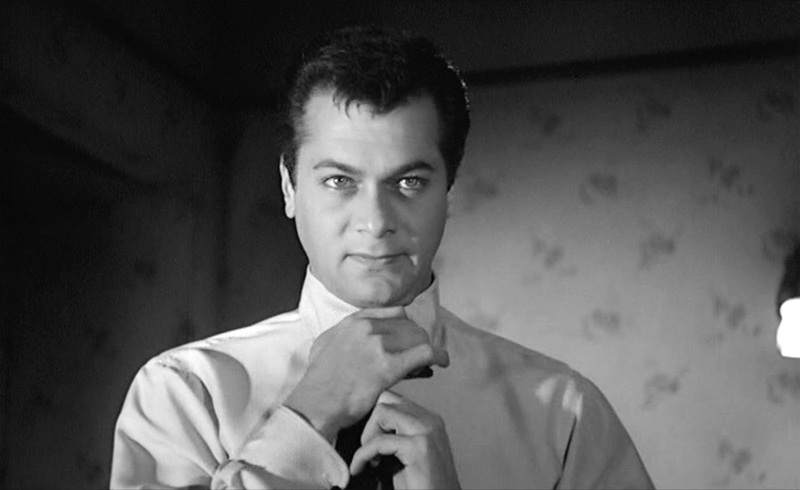 Tony Curtis played against type and many fans were unhappy with his more gritty role. The same could be said for Lancaster, who played a much darker role than some of his previous works. Despite the box office failings of this one, the critics did find much to like about it. Time magazine stated that the movie was “raised to considerable dramatic heights by intense acting, taut direction … superb camera work … and, above all, by its whiplash dialogue”. This praise is more in line with the views of modern critics and fans alike. Despite the poor start, this has become a popular classic amongst fans and critics. If you’re a fan of film noir this is definitely one you should check out. I would also suggest this one to fans of Curtis or Lancaster. This is also one I would recommend to anyone who wants to see great writing. This is one that fans of gritty dramas should definitely check out. I give this one 4.9 out of 5 stars. 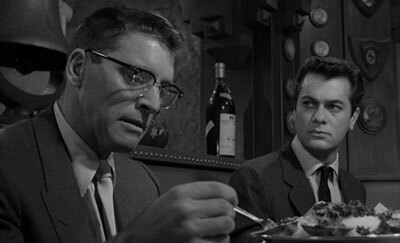 The dialogue in Sweet Smell of Success is on a level of its own, way up high where it’s always balmy. Writing dialogue is truly a lost art. Who do we have today? I think Tarantino has that level of skill, as does Woody Allen. Still, it’s a small group. It’s a movie that has even more resonance in this media-centric age. 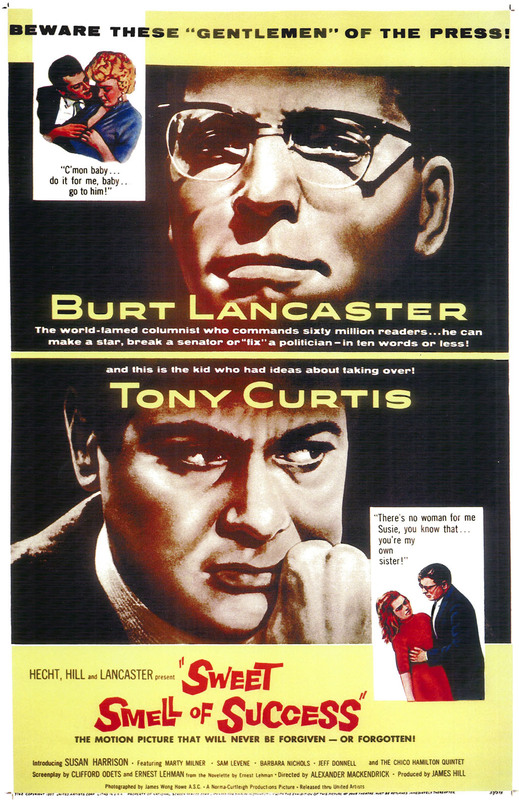 Easily one of Curtis’ best performances, and Lancaster deserves extra props for not only performing the risky, caustic role but also producing the film. The era we live in definitely serves to magnify the greatness of this one. It falls in line with films like Network…. Thanks for checking out the review.